Our company has been active since 1955 in thermal engineering (e.g. tube bundles, heat exchangers and steam generators). Between 1955 and 1981 we named as the firm Gustav Schäfer Abteilung Apparatebau. After the successful conversion into a limited liability company the company name is GSD Wärmetechnik GmbH. Particular challanges ask for individual solution - both in terms of design and with respect to the consideration of physical and geometrical conditions. At GSD Wärmetechnik we always keep an eye on the issues of our clients and try to find the best solution in the field of steam generation, shell and tube exchangers and steam technology. GSD Wärmetechnik is a manufacturer of heat exchangers in different designs for the most versatile usages such as the condensation of steams or gas-steam mixtures, the heating of fluids with fluids, steam or thermal oil, the cooling of fluids with water, condensate, oils, operating fluid of diverse composition with fluids like water or brain. Furthermore we produce steam generators that are heated with hot water, steam or thermal oil. These steam generators are used for example in air conditioning systems, for sterilisation or for the conversion of steam of high pressure to a lower system pressure. Another of our products are tube bundles that can be installed in vessel of diverse designs. 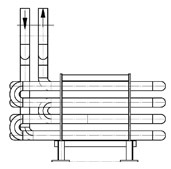 Our heat exchangers have either interchangeable or not interchangeable tube bundles. The condensation or the evaporation take place either in the tube bundle or shell. According to your application of the heat exchanger, you can warm up or cool down liquids or gasses. The media are managed as far as possible in the counterflow principle. The name counterflow heat results from these perfusion. Important for the construction or for the materials is the corrosion behaviour of the heat transfer medium. All our products are designed and constructed by our engineers. Therefore you are sure, that we optimize your heat exchanger for your problem. To find the best solution, we show you some different constructions of heat exchangers.